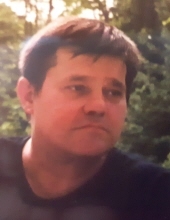 Gouldman, Daniel Scott - Age 47, of Lennon, died October 24, 2018. A memorial service will be held at a later date. Daniel was born on February 9, 1971 in Flint, MI, the son of Richard and Sheila (Newcomb) Gouldman. He was employed as a Dry Waller. He loved life and was a lot of fun. He loved the outdoors and loved working on vehicles. Surviving are father, Richard (Ila) of Boon, MI; sisters, Deann (Edward) Ramey of Lennon; sister Lalonya Gouldman; many nieces and nephews. He was preceded in death by his mother, Sheila, brother Ricky and sisters Lisa and Tammy. Tributes may be shared at www.sharpfuneralhomes.com. To send flowers or a remembrance gift to the family of Daniel Scott Gouldman, please visit our Tribute Store. "Email Address" would like to share the life celebration of Daniel Scott Gouldman. Click on the "link" to go to share a favorite memory or leave a condolence message for the family.